The countdown to #backtoschool is down to its last week now and things are starting to get real for us parents, and especially our little ones. Regardless of whether they are starting school for the first time as preppies, starting Grade 3, starting secondary school, or facing the daunting year that is Year 12, our children can experience varying degrees of anxiety at the prospect of going to school. Did you know that nearly half of all mental health problems begin before the age of 14? Some statistics indicate that 14% of young people in Australia (aged 16 to 24) suffer from some form of mental health problem, and 1 in 7 school-aged children suffer from disorders such as anxiety and depression, but only 1 in 4 receive the help they need. As parents, we all need to do our part to address this very important issue. Are you able to recognise the signs of anxiety in your children? Kids Matter, which is an Australian mental health and well-being initiative developed by mental health professionals for primary schools and early childhood education and care services in order to helps them take care of our children’s mental health, is an excellent resource for families and educators alike, and I reckon all parents should be educated to recognise and learn how to manage mental health issues in children. My child seems to be suffering from anxiety – what should I do? I love books. Who doesn’t? Reading books that address the issue in simple and relatable terms allows you and your child to relax while reading and talk about how he/she are feeling in a non-threatening environment. Here is a shortlist of books that you can read with your child that might help them manage their anxiety. Besides reading, Kids Matter offers a range of recommendations to families for managing anxiety in children, and I think the most important ones that we can all start practicing right now, regardless of whether our children are suffering from anxiety yet, is to help our children practice coping skills and for us to not get angry too easily. I’m a big fan of role playing and talking to my kids about various scenarios – What would you do if this happened? How will you feel? And for children who are prone to nervousness, a psychologist friend of mine once recommended that they carry with them a small item that can be discreetly kept in their pockets, and whenever they start feeling nervous or anxious, they can hold the item in their hands to keep them calm and grounded. Much like the stinky, tattered old loveys that they would carry around as babies and toddlers! And even though at times I fail miserably at not getting angry too easily, it’s something I still try my best to do. It’s one way to model healthy coping skills, plus it helps them build confidence slowly but surely, when they can perform without pressure and when they are not feeling too overwhelmed. But I suffer from anxiety too and I’m not confident that I can help my child! You, are certainly not alone. And bravo to you for recognising your own situation as well as your child’s! Personally, I suffer from anxiety and depression, so I know first-hand how difficult it can be. Some days are good, but others can be a real struggle. I can attest to how anxiety can really affect our bodies and make us feel physically ill. So I know not to brush off such symptoms in children, and neither should you! Your best bet would be to organise professional counselling or therapy for your child (and yourself too if you need it!) – visit your GP and get on a mental health plan for subsidised care, or approach your child’s school for a recommendation to a mental health professional. There shouldn’t be a stigma to getting help for mental health problems – when you are unwell, you see a doctor; and this ought to be no different. Mental health awareness is important, and it starts at home with all of us. Our children depend on us to help them identify their feelings and emotions, and by arming ourselves with some information and tips, I believe we can help them manage those feelings and challenges more effectively. 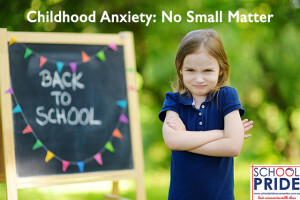 Does your child suffer from anxiety? What has helped you and your child manage their anxiety? We would love for you to share with us! Don’t forget, your 50% off bonus code is still valid until 12th February 2017! Get 50% off any My School fabric items when you check out with the code backtoschool. 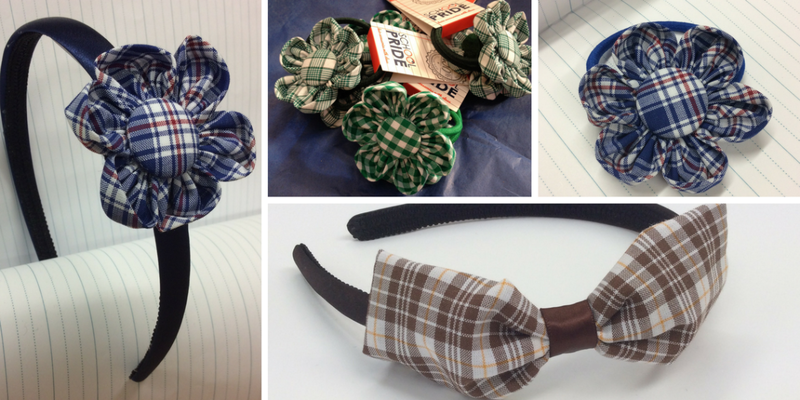 Get gorgeous hair accessories in your child’s school uniform colours, all handmade right here in Melbourne. Click here to start shopping now and take full advantage of your 50% off discount!